The grinding sound that business owners hear in the middle of the night stems from this question. Because small businesses don’t have resources comparable to those of the fortune 500, they are especially vulnerable to significant and catastrophic losses. Total or substantial loss can come from a variety of factors based on the business type, but the most common include things like fires, floods, and other natural disasters. Because of this, a Business Disaster Preparedness Plan must be carefully coordinated with insurance coverages. That small business will rely on those coverages almost exclusively to help them stay or get back on their feet. When implementing the insurance coverage portion of your disaster planning, there are two critical policies that can make or break your recovery plan: Property Insurance, and Business Income Insurance. What is the total replacement cost of all real and personal property including special types of property, valuable papers (i.e. cost to reproduce them), raw materials, specialized tools, and machinery? What if you have to replace your facility at a different location? What are the costs associated with the new location? How much payroll will be needed to retain employees (and/or hire temporary help) during the downtime? How much will it cost to keep the business operating in a temporary facility (renting other premises, equipment, and machinery)? How long will it take to get back to pre-loss revenue levels? 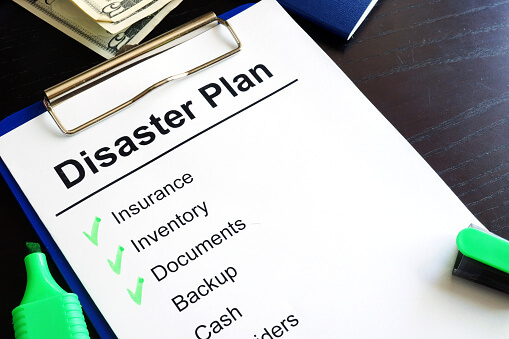 It’s important to remember that beyond the financial elements, a well-designed disaster preparedness plan should also include plans for disasters that affect your vendors and service providers. What happens if a major supplier has a catastrophe and you can’t receive supplies? What if an interruption in power or internet leaves your facility un-usable? With the help of the Trusted Choice agents at Latorre Insurance, you can develop a comprehensive insurance plan that will fully support your disaster preparedness plans. To get started, contact one of our commercial insurance professionals today.